Hi! 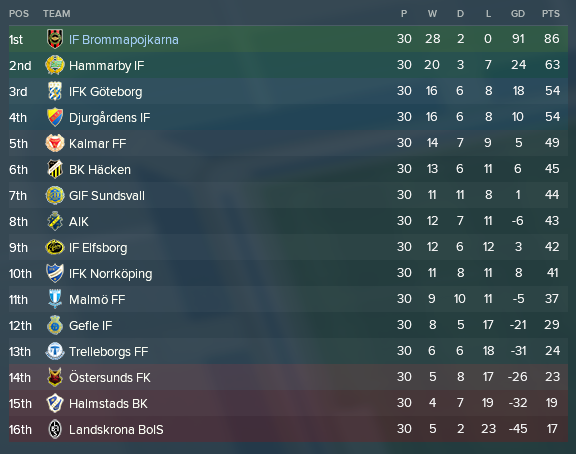 MikaelinhoFM here with the 27th episode of my first ever FM18 blog “The Bromma Boys” about Swedish talent factory Brommapojkarna, and I must say that I’m really loving both the save and this blog series. If you missed last seasons’ updates, do go back and read them through the links below. This episode covers the entire 2028 season. In last season we won Allsvenskan yet again but were knocked out of Europe in the first knockout round of the Champions League. Yet again. The feeling that we have reached a new plateau phase in our development as a team and club. 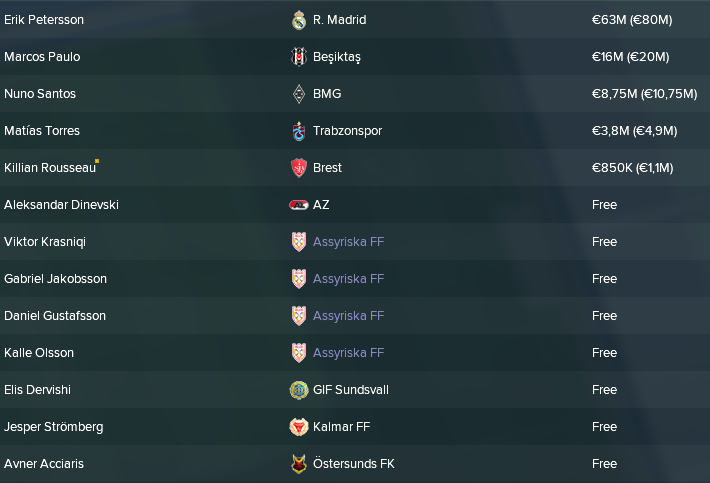 We have established ourselves as the best Swedish team by a mile with a sixth consecutive league title and we’re good enough to get through a Champions League group, but apparently we’re nowhere near good enough to reach the later stages. So this year the goal is apparent – to progress past that first knockout round! The moment I had been dreading came a bit earlier than I had expected. Midfield superstar and wonderkid Erik Peterson had started to attract the interest of European top clubs in the last year. Dortmund came in with a cheeky €18M bid that I rejected immediately. Next day PSG offered us €54M, making it the highest transfer fee received by a mile. All of a sudden every team in Europe seemed interested and while I stalled the bid from PSG several clubs came in with even better bids. 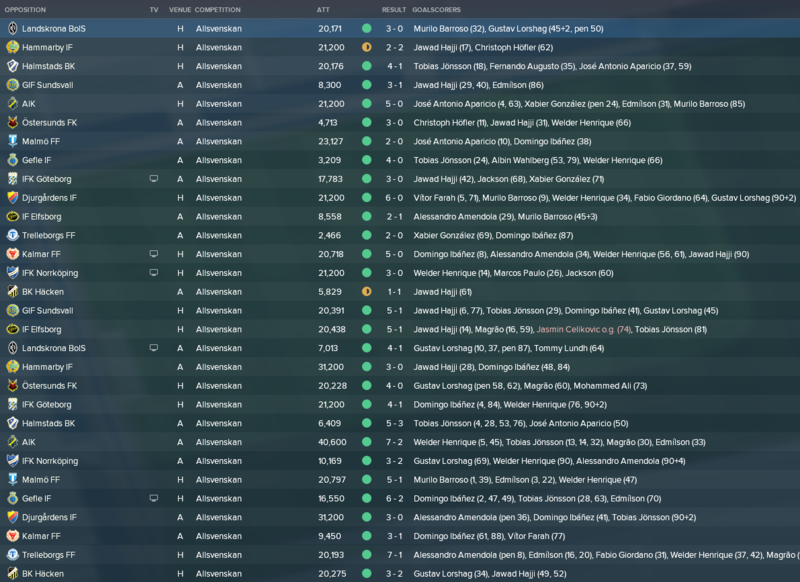 When I managed to negotiate a €80M bid plus 50% of the next sale from Real Madrid I just couldn’t say no, especially since we have so much talent in midfield anyway! It would have been amazing to make Petersson a club legend, but this was too much money to turn down, even though I thought about it long and hard. Good luck my friend, at least we’ll be seeing each other at Sweden games. A bunch of other players left as well. Starting centre back Marcos Paulo wanted to leave and when the bids started to reach silly levels I couldn’t say no. Off he went to Besiktas in a deal worth potentially €20M. I also offloaded some prospects who had failed to impress enough to become first team players. Most of them left for free, but I actually got some decent money for a couple of them. 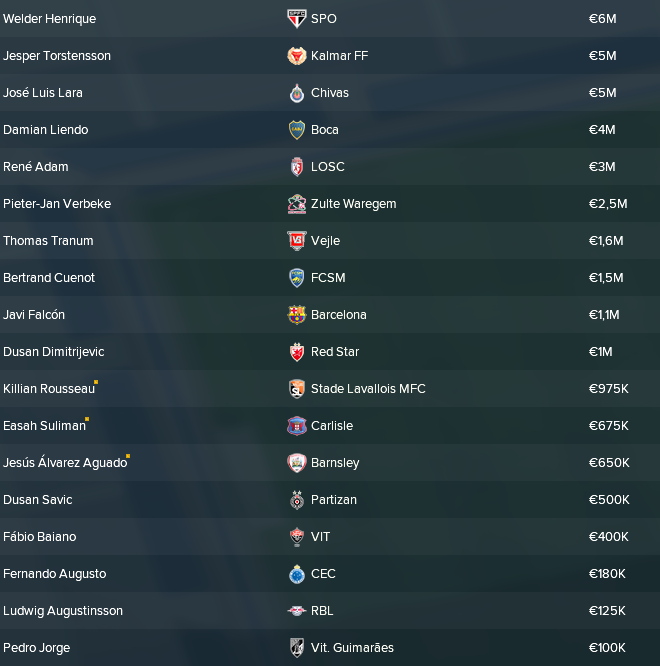 We re-invested a bit of the money made from selling players by acquiring a lot of nice new talents (we’ll go through these in the upcoming Academy Report post) as well as a couple of tutors – marked with yellow dots. We came into this season as Cup champions, and we managed to keep our tradition of winning every group game going. In the cup group stage we tested a new tactic with a bit more freedom, in hope of finding a better tactic to use in European games, and it seemed to be working out fine against domestic opposition. Of course we won the group and entered the knockout stage with a huge confidence. We just kept on winning each game in a very comfortable fashion. In fact, we only conceded 8 shots on goal in total in the three knockout games, which shows how dominant we were! Cup winners for the second year in a row, that’s exactly how it’s supposed to be! With our new 4-4-2 we went into the first knockout round with high hopes. However, we were totally overrun by Valencia in the away game. We conceded an abysmal four goals but managed to score two, so we still had a glimmer of hope of going through to the quarter-final. I tweaked the tactic a bit ahead of the important home game and the team performed exactly as I had hoped. We won 5-1 with bot forwards and both wingers scoring. What an amazing feeling to get past the first knockout round for the first time! The draw against Tottenham didn’t feel too bad. Fifth in the Premier League with a 34 year old Harry Kane still leading the team they didn’t look like an impossible task. How wrong can you get? They absolutely crushed us at their home ground and we needed a similar miracle as in the previous round to go through. I tried to make the tactic slightly more offensive, which backfired massively as you can see above. We lost with an embarrassing 6-0 at home and we were out of the Champions League. We scrapped our new tactic after the draw against Hammarby in round 2 and reverted back to the old one, which really proved to be correct. All of a sudden the passes found the right destination, the shots kept finding the goal and we really looked solid in defence. We just kept on winning throughout the entire season with two unfortunate exceptions, but we still managed to pull off an impressive unbeaten season. Absolutely fantastic! Yet again we won the league by more than 20 points, which is great in a way, but pretty boring in another. Despite our efforts to improve the other teams along the lines of our “National development plan” we have grown way too dominant domestically. The draw was tough on us putting us in the same group as a PSG that has won the Ligue 1 title 15 times in the last 16 years and the Champions League in 2019 and 2021. We were up against Real Sociedad with five consecutive 4th place finishes in La Liga and a Zenit team that had risen from the ashes to win the Russian title five times in the last six seasons. Clearly we were not awake as the first game started as we were rudely awakened when PSG scored after 17 seconds. We must have fallen asleep again because the rest of the game was a pure nightmare as PSG scored five goals in six shots on goal, beating us 5-0. We bounced back swiftly by beating Real Sociedad 4-0 away before an absolutely crazy game away to Zenit in front of a packed crowd of 50000 Russians. With 20 minutes to go we were down 1-3 after Zenit scored on all their three attempts on goal, but after goals from attacking duo Edmilson and Murilo Barroso we managed to even the score. We didn’t settle for a draw though and kept pressing on. In the 95th-minute club icon Magrão managed to score from close range completing one of our greatest comebacks ever! Strenghtened by this turnaround we straight up smashed Zenit at home, before losing once again to PSG. We finished off the group by beating Real Sociedad to finish second. We will play Belgian side Genk in the first knockout round in the spring of 2029, a quite fortunate draw at least on paper. Youngster Domingo Ibañez stepped in and snatched the Fans’ Player of the Year Award away from Jönsson and Magrão with some stellar performances, including getting the most assists. Jönsson scored 25 goals from his right wing position and also managed an impressive 8.20 average rating. Impressive to see that 17 year old Mohammed Ali played good enough to secure a spot in central defence! We managed to take a small step in the right direction by progressing past the first knockout round of the Champions League. We also won both domestic titles, making this our best season so far. Our finances are looking great, and we managed to fill up the Academy with some serious talent, which makes the future really exciting! In the next episode we will take an in-depth look at what’s been cooking in the Academy, aka the Talent Factory, during 2028. The talent pool is steadily growing, but are there any real superstars in the making? The only way to find out is by reading the next episode!